There are currently 3,800 users on this website. they remained, faithful to their Sovereign. command of Admiral Robert Digby. 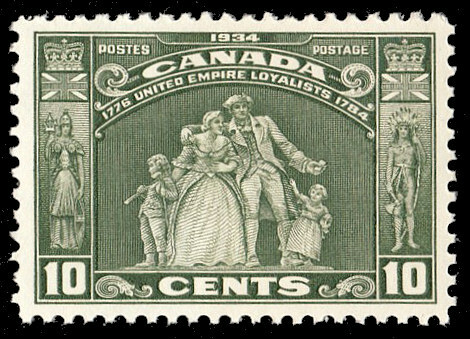 were forced to endure on the trek to Canada and so paid for their loyalty with their lives. losses, gave them thousands of acres of land and about fifteen million dollars in money. birthrights as subjects of the British Empire. the indigenous population as well. There appears very little of it philatelically. Rod, I'm out of town for another week, but if nobody else sends you a scan, I'll do it once I get back home. Great post Rod, you make me proud. 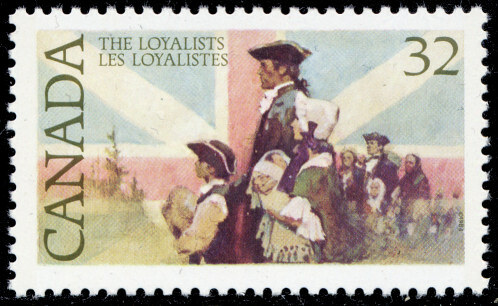 I am a direct descendant of a United Empire Loyalist family that eventually settled in Bedeque, Prince Edward Island. I cannot find my copy of Scott 209 that you show, I am sure someone will post it before I find it. Thanks for the offer Ryan. Thanks Rod, I found it on the Canadian Postal Museum Archives with a cut and paste.